Are you ready for the challenge of Rooster Fishing in Quepos? When most people visit Quepos for a fishing holiday, one of the main goals of their trip is to catch a big Roosterfish. If you speak to any experienced angler they will tell you this is one of the most difficult fish to catch. 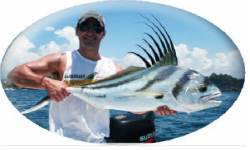 At Quepos Costa Rica Fishing we present you with the best opportunities to catch rooster fish. We know all of the best spots, we have the finest selection of boats and our experienced crew members will give you all of the help you need. Before revealing the fun rooster fishing Costa Rica provides, it is important to know what a Roosterfish is. This is a unique species that is easily distinguishable by its ‘rooster comb’. This refers to the seven long spines of the dorsal fin. Couple this with the silver body with black strips and you will easily notice this striking fish. In Costa Rica you can expect to catch Roosterfish of approximately 40 lbs. Yet it is not uncommon to find those that are of 60 lbs. and sometimes even bigger. When it comes to fishing there is nothing better than the feeling you get when you make a big catch after a tough battle. Catching a Roosterfish is assured to provide this adrenaline rush. They don’t go down easily and thus you will have great fun testing your wits against them. Make no mistake about it, this is a proper battle. You can find yourself in a tense fight for about an hour. Roosterfish have the ability to lull you into a false sense of security. You think you have made the catch, but the fierce fighter could be ready to take control of the battle at any second. So, how do you approach this intense and thrilling battle? A lot of novices make the mistake of going for a quick hook set. However, the key is to be patient. Wait until you know the fish has the bait and count until ten. It is a lot more difficult than it sounds, but it is definitely the best way to go when you want to hook a Roosterfish. You also need to be careful because often a Roosterfish won’t even realize it has been hooked and so it begins to swim away. You will get a lot of your line back and this can make you feel like you have won the battle. But the truth is; it has only just begun. Once the fish realizes it has been hooked prepare yourself for them to attempt to dive are engage in rapid head rocks.